By the end of the 1820s, the waistline of dresses was at the natural level. The fashionable style of sleeve was very full, tapering to a narrow circumference at the wrist, known as a 'gigot' sleeve. Skirts had become fuller since the beginning of the decade. 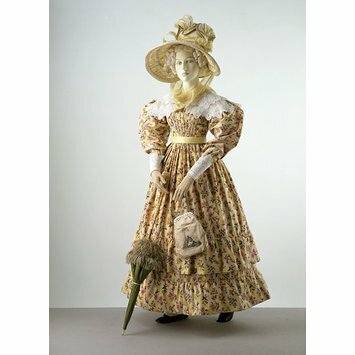 This particular example illustrates a popular style of day dress made of brightly coloured printed cotton. 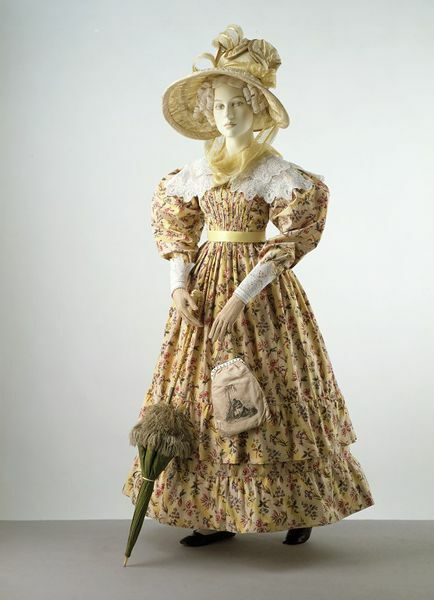 Dress made up of yellow and buff striped printed cotton with a floral sprig pattern. The dress has a low oval neckline and a pleated bodice. There are four straight breadths in the skirt, which is pleated into a waistline placed slightly above the normal level. Two deep flounces above the hem. Leg-of-mutton sleeves with a deep pointed cuff. All the main structural seams are piped. The bodice is lined with white cotton and fastens at the back with rectangular section bronze hooks. With two textile fragments.